Our spectacular villa is located on the very prestigious Emerald Island Resort. Situated just 3 minutes from Disney, it provides the privacy of a beautiful gated resort of grand houses, surrounded by a conservation woodland. Our villa is uniquely furnished with four poster beds and designer drapes and canopies. Our stunning villa is situated on the very prestigious Emerald Island Resort. It offers the privacy of a gated resort lifestyle in a one-of-a-kind secluded location. Just 3 miles from Disney, the resort offers a quick escape from the busy Theme Parks. The winding palm lined road which leads to Emerald Island is a prelude to the community's grandeur. The collonade entry, complete with a silver dolphin fountain and picturesque rotunda provides a dramatic arrival to the communal Clubhouse with its fitness centre, sauna, steam room, games room, internet cafe, tennis courts, volley ball and children's play areas. We decided not to have the usual "furniture package" which everyone else had but sourced every piece of furniture ourselves so that we could make our villa as unique as possible. It has 7 double bedrooms (2 en suite) and 4.5 bathrooms. The master bedroom is huge and has a beautifully draped four poster bed. The en-suite is large and has a walk in shower. 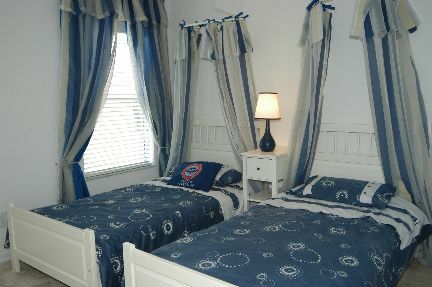 There are three further double bedrooms (1 en suite) and all have four poster beds. The further three bedrooms are twin and are beautifully furnished with canopies over the beds. There are very large lounges so that two families could easily share but still have their privacy if that's what they want. There is a formal dining room and also a nook next to the large kitchen. The whole area is open plan and very spacious. The fridge makes continuous ice, just right for those gin and tonics. There is a dishwasher, microwave and cooker. There is also a laundry room with washing machine and dryer. (I know we don't want to do the washing, but needs must). The pool area has an very large extended deck and a spa so that you can relax in the evening whilst the kids have fun in the pool. A gas barbeque is available to hire from our Management Company at $7 a day and ideal for al-fresco dining, so the men can cook whilst you relax. The Games Room has a pool table, air hockey and table football. There is cable TV, of course, as well as DVD players in both lounges and a Playstation, Home Theatre System and video player. 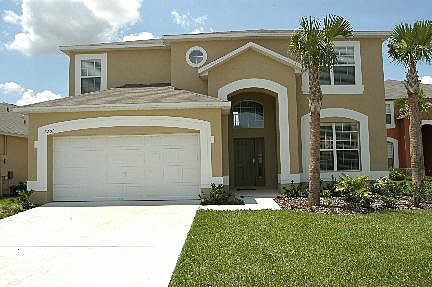 Emerald Island really is just 3 minutes from Disney and very close to 24 hour shops and restaurants. It's just 1/2 mile off Highway 192 which is a hive of activity, but nevertheless nestles in a beautiful conservation area. The resort is a gated community with beautiful fountains, nature trails and many lakes. Our villa backs onto a lake and conservation woodland. The Clubhouse at Emerald Island has communal pool, gym, tikki bar, cyber cafe, sauna and children's play area so that you can get to know people and the kids can make friends. The staff at the Club House are very friendly and helpful with lots of useful information at their fingertips. der Urlaub war klasse. Insbesondere von dem tollen Haus waren alle total begeistert. Emerald Island ist ein phantastischer Ort zum Ausspannen und Erholen. Nicht zuletzr dank der grossartigen Unterkunft hatten wir einen tollen Urlaub und werden uns sicherlich beim nächsten Aufenthalt in Florida wieder mit Ihnen in Verbindung setzen.